Finding chewing gum stuck to your clothes is never a fun discovery. However, this unwanted discovery doesn’t have to mean the end of the line for your favorite pair of pants or a sweater. 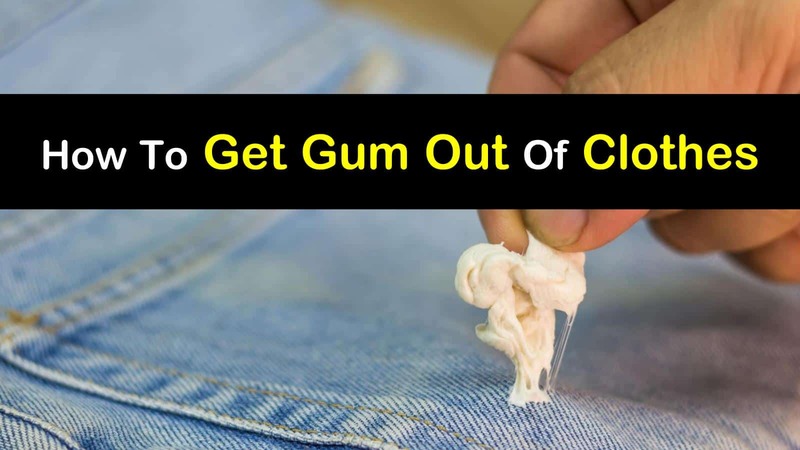 Whether chewing gum has found its way onto your child’s school uniform, or you’ve sat down on the commuter train only to encounter an unpleasant surprise, you can learn how to get gum out of clothes with these various approaches and home remedies. These tried-and-true home remedies for removing chewing gum and its sticky residue from your clothes, are easy to complete and use simple, everyday items that won’t cost you a fortune. You can remove gum from clothing, whether you’re at home, work, or on the go, with these easy cleaning processes. When you find a wad of gum clutching the arm of your sweater, stuck to the seat of your pants, or jammed into your kid’s coat pocket, you often wonder, how it got there. While you may never know how that sticky gob of gum got there, you will know how to get it off with little fuss. 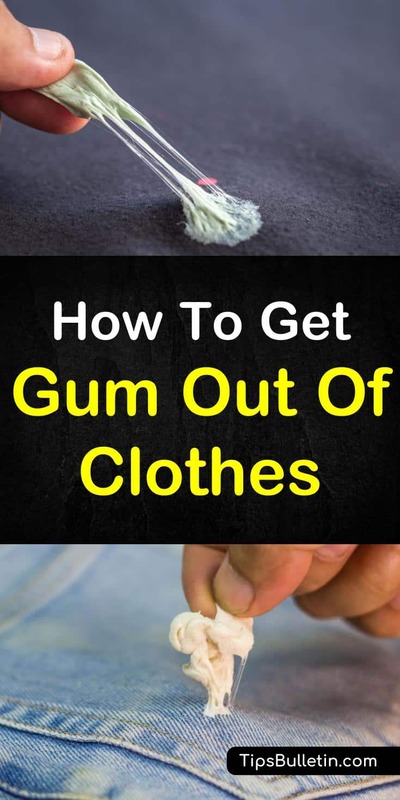 Depending on the kind of material you’re dealing with, here’s how to get gum off clothes. You can use liquid laundry detergent and an old toothbrush to remove gum that is stuck on your clothing. First, cover the entire area that is affected with the liquid laundry detergent that you have on hand. Take an old toothbrush and work the laundry detergent into the gum. Gently scrape the gum away using a blunt knife. Use your fingernails to scrape any remaining gum from the fabric. Place the garment in the washing machine and launder as usual. If you’re at home when you notice the gum stuck to your clothes, you can use your iron as a way to remove chewing gum from your clothing. You’ll need to grab your iron and a piece of cardboard for this method. Start by placing the garment on top of the part of cardboard, so that the gum is between it and the fabric. Place the iron on medium setting and iron over the affected area. The heat should help the gum transfer from the material to the cardboard. Move the piece of cloth to a clean part of the cardboard and repeat the process until a majority of the gum has transferred to the cardboard. Place the clothing in the wash and launder as usual. Before throwing the clothing in the dryer, check to make sure all the gum is gone. If you need to know how to remove gum from jeans, look no further than the items in your pantry for your solution. Peanut butter works well when you need to get gum out of pants. One thing that you need to keep in mind with this method is that the peanut butter will likely leave a stain because of the oil that it contains. If you do notice stains on the clothing after using this method, you can use a liquid stain remover before washing. Spread the peanut butter over the gum. Cover as much of the gum that you possibly can. Let the peanut butter stand for several minutes until the gum gets softer and loses its stickiness. Using a blunt knife, scrape the gum gently from the fabric. It is important that you expose as much of the gum as possible to the peanut butter so that it can adhere to the gum, leaving it unable to adhere to the fabric. Apply the stain remover over the affected areas and launder as usual. Add the 3% hydrogen peroxide and all the ingredients in a spray bottle. Replace the lid and shake to ensure the parts are thoroughly mixed. Spray the solution on the stain and allow to stand for five minutes. Scrub the area with a scrub brush. Wash as usual. Here’s how to remove chewing gum from delicate fabrics. Rubbing alcohol is great for removing sticky substances from delicate clothes because it won’t stain or fade the colors of the material. It is the main ingredient for various spot cleaners e.g. to get wax out of fabric or to get oil stains out. To use this method, pour a small amount of rubbing alcohol onto a sponge or clean rag. Use the sponge to rub the gum and allow the alcohol to stand for a few minutes. Then, take a dull knife or wooden spoon and gently remove the gum from the material. Wash the garment in soak and water and allow to air dry. There are two ways you can freeze gum to remove from clothing. The first method involves placing an ice cube, or freezer pack on top of the gum. Place ice cubes on the area will freeze and harden the gum making it easier for you to pop or scrape the substance off using a paint scraper, credit card or dull knife. A more hands-off approach is to freeze the gum in the freezer. First, you need to fold the garment, so the affected area faces outward so that you can see the gum. Next, place the clothing in a plastic bag, making sure the gum doesn’t stick to the bag. you can remove the bag from the freezer, and take the clothing out. As quickly as possible, peel the gum from the garment. Use a dull butter knife to scrape off the remaining residue and launder as usual. Boiling the garment is another way to get dried gum out of clothing. Fill a large pot with water and bring it to a boil. When the water begins to boil, you can submerge the affected part of the garment into the container of boiling water. While the clothing is submerged, carefully scrape the gum off using a putty knife, an old toothbrush, or dull knife. While you immerse the fabric in the water, use an old toothbrush to scrub the affected area. Let the garment dry and repeat the process if necessary. You can also use a tea kettle to boil the gum away. Place a tea kettle filled with water on the stove and bring it to a boil. When the pot begins to boil, place the area of fabric that is affected by the gum, directly over the mouth of the kettle so that it is directly in the stream of steam. Leave the garment over the steam for a minute to soften the gum. With an old toothbrush, scrub the area in one direction to remove the gum. Heat a cup of white vinegar on the stove or in the microwave. Bring to just below a boil. Dip an old toothbrush in the vinegar and rub the gum. Vinegar can be used best when it’s hot, so you will want to do this quickly. Continue to dip the toothbrush in the vinegar and rub the gum until it is gone. You may need to reheat the vinegar during the process. To remove the vinegar smell, wash the garment as usual. >> Extra Vinegar Laundry Tip: Mix white vinegar with laundry detergent to make a powerful spot cleaner for coffee stains. You can use the stickiness of the duct tape to remove gum from your clothes. Take a roll of duct tape and cut a strip from the roll. Press the tape firmly onto the gum, ensuring you cover the entire surface of the gum. Try to avoid pressing the whole piece of duct tape into the fabric, because it will be challenging to remove. Peel the tape back from the gum, peeling up the gum with it. If needed, cut another strip of tape from the roll and repeat the process until you completely remove the gum from the fabric. Hairspray isn’t just for styling your hair. Besides for removing lipstick stains from clothing, it can also be used to get gum out of your clothes. Spray a small amount of hairspray directly onto the gum. The hairspray will cause the gum to harden. Immediately scrape or pick the gum off the fabric. Because the gum has set, it should break off easily. Continue to scrape the material until you remove all the gum. Wash as usual. Canned air does more then remove dust and debris from your keyboard. It also acts as a freezing agent that, when used on gum, will solidify it. Spray the canned air directly onto the gum until it becomes hard enough to scrape off. Use the edge of a credit card or dull knife to scrape the gum from the garment. Throw it in the washing machine when you get home and wash as usual. The next time your kid comes home with a wad of gum stuck to his clothing, don’t panic. These tried-and-true methods for getting gum out of clothes will allow you to remove the gum and safe the garment quickly. Each of these techniques will effectively remove gum from your clothing with the help of everyday household items. We hope you enjoyed learning how to get gum out of clothes. If you found the information in this article useful, please don’t hesitate to share it with your family and friends.